WaFoo outside of WaFoo: "NY 2022"
Kazuo the band leader gave me a call about a week ago. He asked me if I wanted to participate in the project at Guggenheim Museum in New York with Richmond County Orchestra. He also asked me to play the contrabass but not the cello. I play the contrabass in small ensemble setting regularly but nowadays I only play the cello with orchestra. 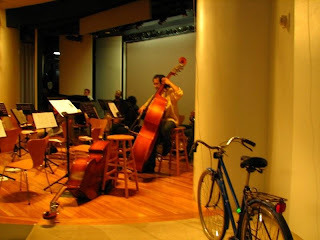 Just because I could play the contrabass in an orchestra, I canceled a gig in Boston and decided to stay in New York for it. Three of the members of WaFoo participated in this project: Kazuo (principal contrabass), Yuuki (flute) and me, Ippei (contrabass). The name of the project is "NY 2022;" This avant-garde play is based on the movie "Soylent Green" (1973). The year is 2022, New York is extremely populous with 40 million people, short of food, housings, electricity and what not. The story is about the people who live in such dystopia in the near future. Two words: avant-garde. The stage direction was really out. I have worked in theaters quite a bit and have seen and played in lots of productions. I would say this is the most avant-garde play I have ever performed for. Frankly speaking, I can not say I understood every bit of it. Principal Miyata of Tokyo University of the Arts once said "you don't need explanations for this kind of thing." Tokyo University of the Art is the top art school in Japan and Mr. Miyata has much experience and knowledges in avant-garde arts. I chose not to write what was different and strange from ordinary because I do not think I have ability to report this whole setting accurate enough and am afraid that I may mis-convey the producer's message. Just one art work or one concept sometimes changes drastically the arts which follow. Picaso's "The young ladies of Avignon," Miles Davis' "Kind of Blue," Sen no Rikyu's Wabi-cha, etc. etc. Preserving and developing traditions is important, but at the same time, breaking out of the mold of convention is as important. I have learnt a lot from this project. Fall arrived to New York. Don't know when, don't know where it's from but it is here. I apologize for the delay on renewing the blog and now I would like to put the belated report of the Fall concert which was held on the end of the last month. The annual Fall concert was held at St. Peter's Church in Staten Island, New York. 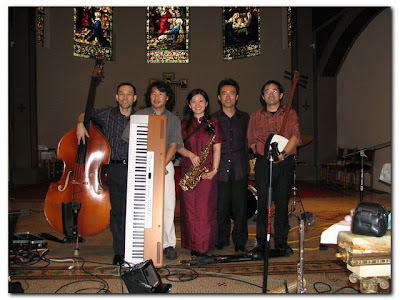 This concert was also for the announcement of the release of our first album "Organic Mood." We put our hearts and souls for this concert even more than usual. You might think taking five long years after the band started running to release the first album was way too long, but from the moment we formed the band, we expected to take a long time to shape our style before doing any recording. The reason was the peculiarity of the style and the orchestration of our band. Our band is unique. Nonetheless to say, it was much easier to play in established settings, we, however, chose not to follow that path. As all other artists, we wanted to be different even though we would need long painful years and a lot of efforts. Arts are all about going beyond the existing limits. The most remarkable thing for me on this concert was that I realized WaFoo stepped up to a completely different level. It may sound like a cheap self-glorification but it is not. Taking an objective view as a professional musician, "completely different level" is very appropriate expression. Took us five years. The band had come long way. When this thought came up to my mind in the concert, I was almost moved to tears in the middle of playing. My heart was full. I am so glad that the whole band members stuck together and have persevered in making this band happen. Let's keep at it and make our music beautiful. I would like to thank everyone who came to our concert. We need your support and certainly hope you will keep coming back. On September 28 (Sun), we had our Fall concert at our home ground, St. Peter's Church in Staten Island NY. Thank you very much for all those who came to the concert and gave us such wonderful comments! It is always so nice to hear that our audience enjoyed the show as much as we did on the stage. And here is another good news. We will be able to bring you more concerts this winter than before! The dates will be announced very soon. So please stay in tune with us!